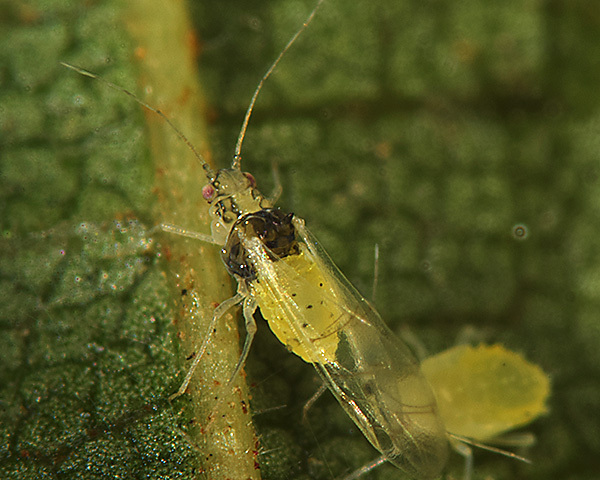 Tinocallis aphids are mostly small species. All viviparae are winged and usually have paired spinal and marginal tubercular processes. Some species have conspicuous black markings on dorsal body and/or on the forewings. The antennae are as long as or shorter than the body. The siphunculi are stump shaped and the cauda is knobbed. There are about 18 Tinocallis species, usually associated with elms (Ulmaceae), although species have also been described from Lythraceae and other families. 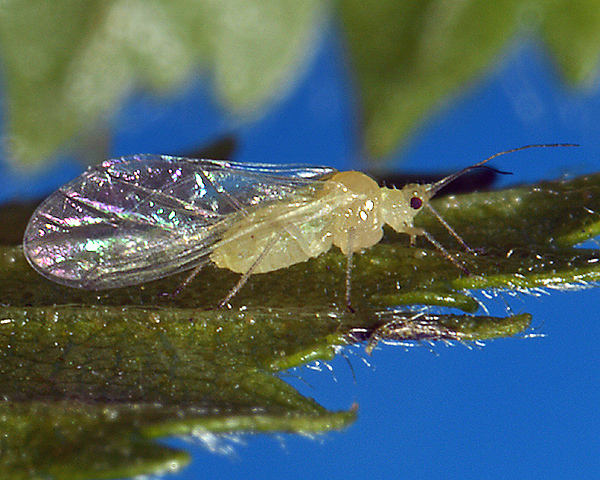 They have a sexual stage in the life cycle, but do not host alternate and are not attended by ants. In spring and summer, Tinocallis nevskyi alates are pale yellow, with pale or dusky antennae and legs (see first picture below). In autumn Tinocallis nevskyi have pigmentation on the head, thorax and siphunculi and frequently also on the tips of their marginal tubercles (see second picture below). Their antennae are 0.76-0.96 times the body length. The wings are hyaline and the veins of the forewings are not bordered with fuscous, nor is there a patch of fuscous on the hind margin at the end of vein Cu1b (cf. Tinocallis takachihoensis which has the distal branches of the media bordered with fuscous and fuscous patches at the distal ends of Cu1a and Cu1b). The pronotum has two pairs of pale finger-like spinal processes, and the mesonotum has one pair of large conical processes. The abdomen has spinal processes on tergites I and II, and lower wart-like tubercles on the other tergites and marginal tubercles. Tinocallis nevskyi siphunculi are short. The body length is 1.4-2.1 mm. Immature alatae are pale greenish yellow. The winged viviparae of Tinocallis takachihoensis (see first picture below) are pale yellow-green with a shiny black head and thorax. The pattern of black markings on the wings is diagnostic. There is a black patch where the hind femur meets the hind tibia. The pronotum and mesonotum each bear a pair of dorsal processes. The pair on the pronotum are small and pale, whilst the pair on the mesonotum are large and dark. There are also two pairs of paired dorsal processes on the abdominal dorsum. The head bears no dorsal processes (cf. 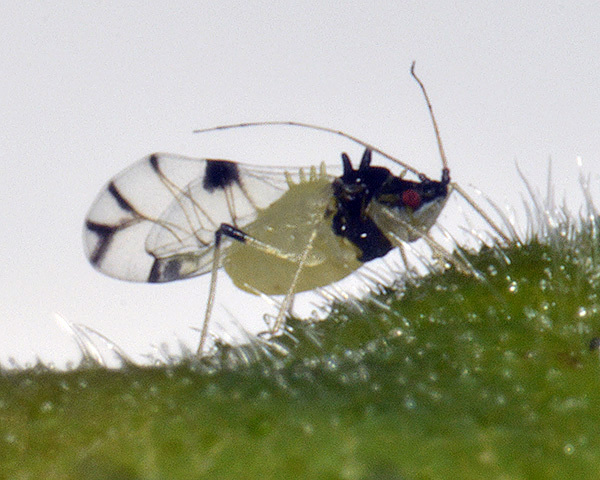 Tinocallis ulmiparvifoliae which has three pairs of dorsal processes on the head), and there are no brown markings on the abdominal dorsum (cf. Tinocallis platani which has extensive dark dorsal makings on the abdomen). The body length of Tinocallis takachihoensis alates is 1.8-2.0 mm. The immatures are pale yellow green with numerous tubercles topped with capitate hairs. 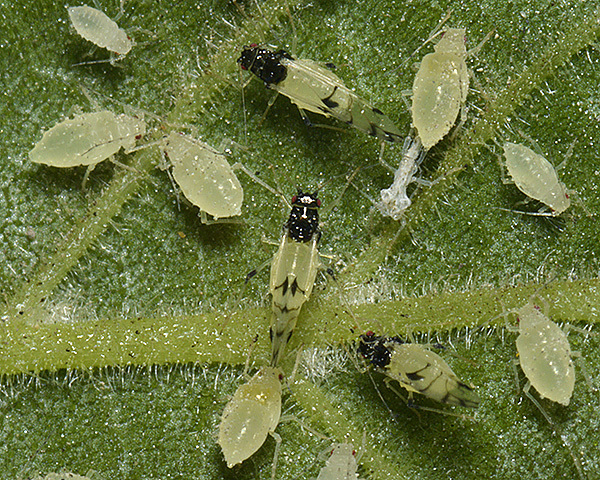 They form large colonies with the alates on the undersides of the leaves (see second picture above).